Jan Molam : Onuma Singsiri - "Mae Kha Som Dam", the somdam vendor...from Vinyl! If you like Molam you have heard her song "Mae Kha Somdam" for sure...its included on the splendid "Sound of Siam" compilation. 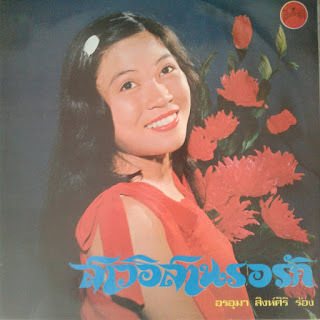 The LP with this song is "Sao Isaan Ror Rak" (Isaan girl waiting for love), and its amazing. It blends Pop with Molam style, and you will find Isaan pop (the first 2 tracks are related - first Onuma has her saying, and in the second song her male companion answers, a song form that is called "rong gae"), great ballads ("orn sorn siang sor", track 7), funky stuff with wah-wah guitars and traditional Molam. Actually, there are lots of awesome 45s which are not found on any LP. If you see anything by Onuma Singsiri, just get it...whatever she sang sounded great! But please hear for yourself - enjoy!